Want to know latest Bridal trends coming off of the runways? I have the latest from New York Bridal Fashion Week and some Tips on Planning your Perfect Wedding Look! 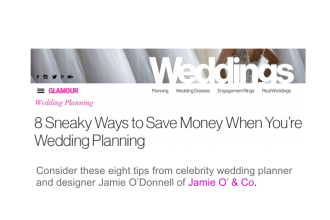 I am so honored to have been featured in Glamour Magazine sharing insider wedding planner tips on how to stretch (or save) your budget!